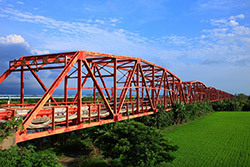 In former days the Xiluo Bridge, which is stretched across Zhuo Shui river, was part of the vital trafficway in the south of Taiwan connecting the northern and the southern part of the island. In 1912 the waters of Beidou and Huwei brooks converged to Xiluo river (Zhuo Shui river), carrying large quantity of silt and creating deposits. In the wintertime the river water dried up and the river became just a stream, in summer the water level rose again and bamboo rafts became important means of transport to cross the river. When rainy season started and the river water rose suddenly and sharply, bamboo rafts were unable to carry passengers, so communications between one bank and the other were usually cut off for security reasons. Consequently in 1936 some local public figures established “Zhuo Shui river Vassals’ League to erect successfully the bridge”. They made arrangements with the Japanese governor and gave him a full account of building the bridge. So the engineering started and in October 1937 the constuction work began. 312 piers were built during the following three years. But the World War II started and due to the attack on Pearl Harbour the Japanese removed the bridge ridge to bring it to Hainan Island (in South China) to build a dock, so the engineering had to stop. After the war, the mayor of Xiluo, Mr Li Yingtag, and a local gentleman founded the “Commission to continue building Xiluo bridge” and they kept giving detailed accounts to the governor. Finally in 1951 they got a financial boost from the USA, so an engineering partnership with the Taiwanese government started, and on the 28th of May 1952 the work to build the bridge started again and on Christmas of the same year it ended. The Xiluo Bridge was opened to the traffic on the 28th of January 1953. At the time Xiluo bridge was the second greatest bridge in the world after Golden Gate bridge in San Fransisco and the first in the Far East.